Repairing the flat roof of an industrial or commercial building requires precision and technical knowledge. It is not something anyone can do on his or her own. Every flat roofing system is unique in its size and materials and structures, and flat roofs are famously vulnerable to damages from standing water. Flat roofs also suffer from significant exposure to the sun. Like any issue, if left unaddressed, small damages to your flat roof can quickly become big, expensive problems. If left alone long enough, issues can compound and lead to the need for a complete roof replacement. Don’t wait and risk letting small repairs to your flat roof build into a larger issue. 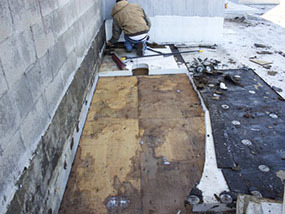 If you are in need of a simple or intensive flat roof repair in Parkersburg, OH, E&E Construction can help. Call us at (740) 331-0695 to consult with our professional roofing technicians at no cost. 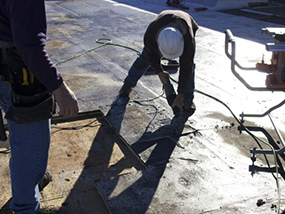 If your commercial or industrial building’s flat roof requires a repair, you can count on us, E&E Construction, to meet your specific roofing needs. We have a team of experts that deliver the best in quality care and roofing services. They are trained to quickly detect the problem and suggest the necessary measures for repair. The professionals at E&E Construction have more than a decade of experience, and we pride ourselves on keeping up-to-date on licensing and certification to ensure that our knowledge and practical skills are cutting edge. We are also conscious of our clients’ budgets and work hard to stay within range. While we strive to be affordable, we don’t sacrifice quality. We use premium products, formulated and manufactured by Conklin Roofing System. Our products ensure the longevity of your roof and improve its durability. As an added bonus, our roof coatings also make your roof look better. We also offer non-prorated warranties of up to 20 years that cover 100% of labor and material costs. We address all types of problems regarding flat roofing. No matter the size of your roof, no matter the problem, we are equipped to handle it. We make your flat roofs durable and waterproof through the use of premium products from nationwide company Conklin. We apply products that can make your roof reflect up to 83% of the sun’s rays, resulting in A/C savings of up to 25% yearly. We offer ENERGY STAR® certified solutions, so you can feel good about the improvements you’re making to your roof. We believe in delivering solutions that are custom tailored to customers’ needs, and we are invested in building long-lasting relationship with our customers. That is why we offer reliable and lasting solutions for flat roof repair. You can contact us at (740) 331-0695. Get in touch with us today to get a professional evaluation of your commercial flat roof and begin the journey to getting it in tip-top shape.